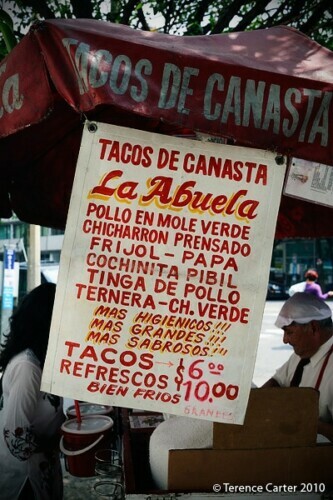 A street food tour of Mexico City was high on our agenda. We’ve always loved street food and love Mexican cuisine so when we arrived in the capital we signed up for a tour with Lesley Tellez of Eat Mexico. One of our strongest food memories from our first trip to Mexico City in the Nineties is the smell of corn tortillas on the street, long before they were banned from being sold on the historic centre footpaths. In the Middle East, where we lived for almost a decade, we’re smitten with the shawarma, we’d go anywhere for great falafel, and we’d climb hills for creamy hummus. One of our favourite assignments last year was an informal street food tour with a local chef in Amman, Jordan. 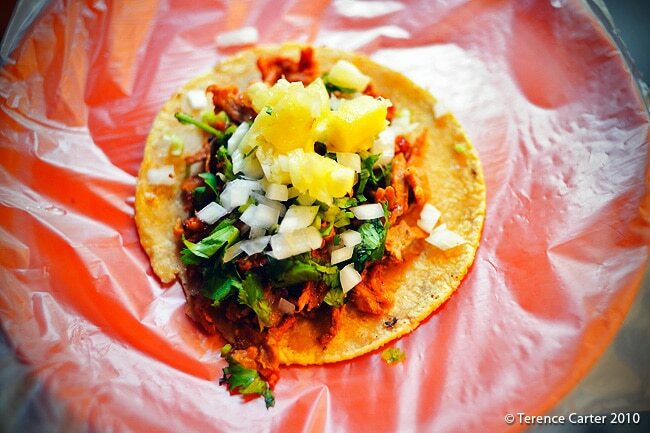 The made a street food tour of Mexico City high on our agenda. While we’re familiar with Mexican cuisine, we have to admit that our knowledge of Mexican street food was fairly limited until this trip. Despite being cautious when it came to eating on our first few visits to Mexico many years ago, we experienced several ugly bouts of Moctezuma’s Revenge, putting us off street food for a while. A long while. These days, our stomachs can pretty much handle anything – toughened up by our anything goes style of eating around the world in recent years, and the constant travelling that has prepared our bodies to deal with almost any kind of bacteria. That, combined with the fact we fell in love with tacos all over again in Austin, Texas (thanks to a little help from our Taco Journalism friends), had us eager to sample more and put a street food tour of Mexico City at the top of our to-do list. Fortunately, we didn’t have to look hard to find Lesley Tellez of Eat Mexico. A journalist living in D.F., Lesley offers food tours when she’s not learning the art of Mexican cooking and blogging at The Mija Chronicles. 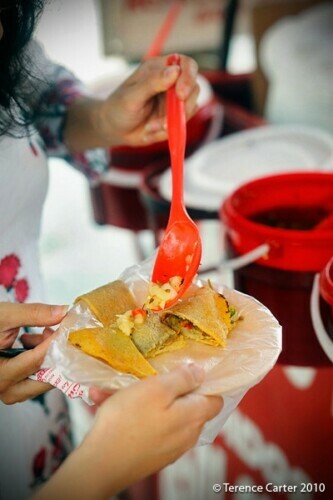 Lesley was the first food lover to offer a street food tour of Mexico City. 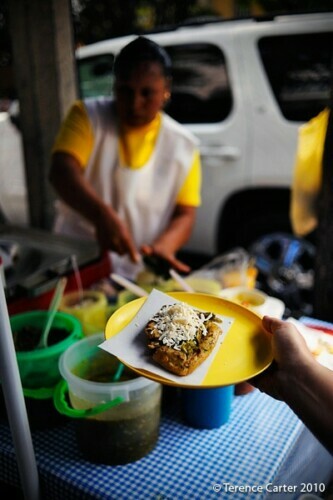 We kicked off our street food tour of Mexico City on Río Lerma in Colonia Cuauhtémoc where we met Lesley mid-morning. She shared her background as we began to walk. We missed the tamale woman where Lesley usually starts her street food crawl – she’d obviously sold her treats and had gone home for the day – so we moved onto Tacos Don Güero on the corner of Río Lerma and Río Amazonas. 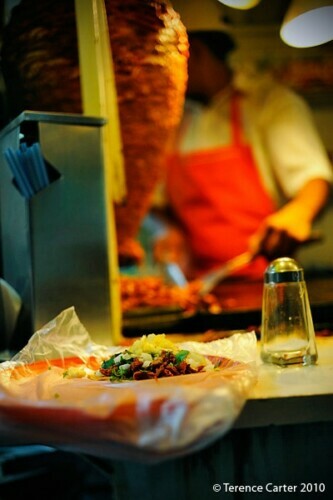 Here the specialty is tacos al pastor, the tacos that are synonymous with Mexico City, and are our favourite. 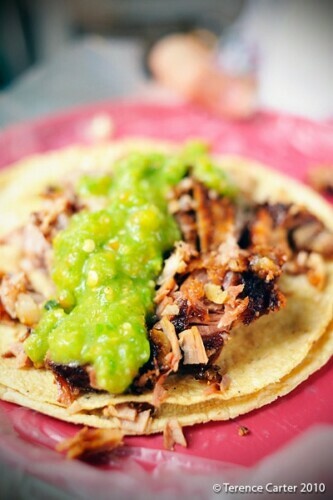 Grilled on a vertical spit with a pineapple on top, the meat is continuously shaved off and kept warm on the grill beneath it, then placed on the tortilla, along with onion, salsa and cilantro (coriander), to order. An ancestor of the shawarma, which my research had already revealed was brought to Mexico by Lebanese and Syrian immigrants in the 1920s, the main differences between the two are the types of spices used and that pork that is used in Mexico, instead of lamb or chicken, which are used in the (Muslim) Middle East. Coincidentally we’d noticed this stand when we wandered by a couple of days earlier and had intended to return. We’re glad we have and we’re not disappointed. The pork tacos are incredibly tasty. 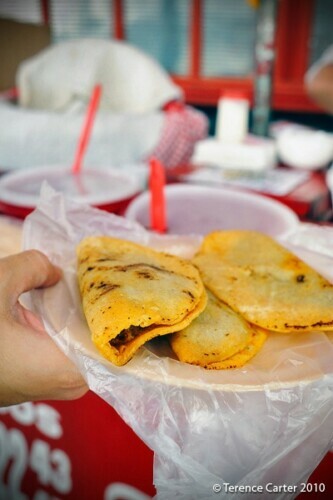 Our next stop on our street food tour of Mexico City was the stand of the woman who Lesley told us had been working on the street for eleven years selling her tlacoyos, fried masa patties that look a bit like fat, oval-shaped tortillas. We tried one topped with beans and chicharones (pork crackling), another with beans and nopales (cactus paddles), and another with quelite (wild Mexican greens). It was rustic home-cooked fare but it all tasted fantastic. 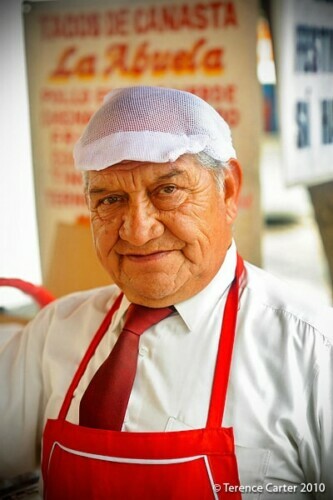 A short amble away on the corner of Río Lerma and Río Rhin, we stopped at La Abuela, where a dapper old gentleman in a smart tie and shirt was selling tacos de canasta or ‘basket tacos’. The pre-prepared tacos are filled while both the tortillas and fillings are hot, put in a basket, and covered with a cloth, so that they’re almost steamed. We tried the cochinita pibil (slow roasted pork) and tinga de pollo (spicy stewed and shredded chicken with chipotle) and they were both scrumptious and very moreish. Our last stop was a busy no-name stand, manned by two amiable young guys who looked like they took their job as seriously as we took their tasty carnitas or ‘little meats’. The specialty is the succulent pork, slow-cooked in lard in a cauldron of sorts before being roasted. You can order specific cuts, such as the nana (uterus) or trompa (snout), buche (throat), and lengua (tongue), or, as we did, order sortida, a combination of pork pieces mixed with the fatty bits. It was sublime. “These places never have any signs,” Lesley warned. “Look for the glass case with pork steaming inside, and listen for the sound of chopping on a wooden breadboard,” Lesley suggested. A great tip, among many. 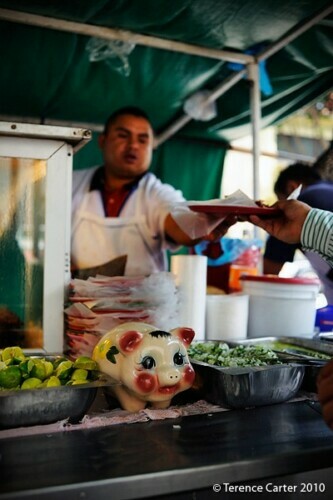 I adore the street food in Mexico and I’ve eaten at dozens of street stalls in D.F. Thanks for covering, and encouraging tourists to eat at these rather than what is often mediocre and overpriced eateries, especially in Centro. Another thing about street food is, it’s often more hygienic than restaurant food. As it’s made right in front of you, and you can see who’s dealing with money/food, there’s nothing to hide… A restaurant can have things sit for hours, microwave it, and you’ll be none the wiser until a few hours later…! Thanks for your comment Jack. We’ll be writing about the ‘sit-down’ food scene too – and we agree with you. At one recommended restaurant I had a full view of the kitchen and two very overworked microwaves! Can anyone explain to me what cactus tastes like? Frank mentioned it in his winning post for the August competition too, so I am really curious now as to what it’s like, as I simply cannot imagine, and I didn’t even realise you could eat cactus! I absolutely loved Austin when I went over to our HQ for a visit, and now you definitely have me wanting to go to Mexico too. I think a mini road-trip around the southern States and then across the border may be in order! 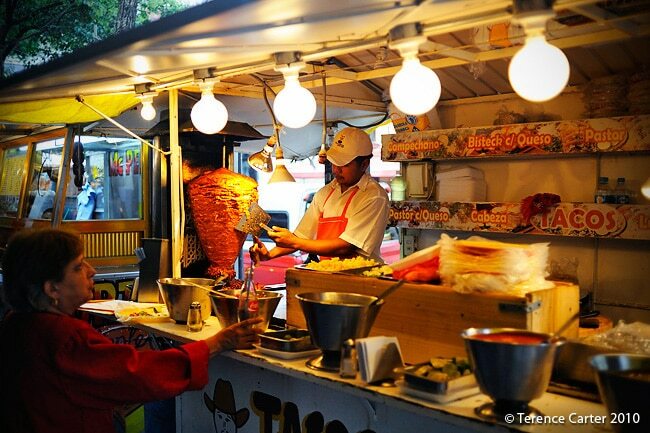 Not tried street food in Mexico but your post has won me over to put that on the list too. Aaahhh, I haven’t quite got my tummy to handle all street foods (still feel a little queasy because I thought I could handle some Thai street food) but its not going to stop me – its some of the best food in the world. Love it too. Jack hit it on the head! Whenever in Mex, I just dive into the street tacos, fruits, tamales and bacon wrapped hot dogs. Yes, I eat them too and now, I even recreate them. So great to see this post. If you don’t give it a try, you’re truly missing out. Love your blog. Just found it and definitely reading more!!!! Happy trails. I love street food in Mexico. Some of the best meals I had there were from street vendors. Just as long as there are two people working the stall, one to handle the money and one to cook then I generally feel confident eating it because this is often a sign of attention to food safety. Money is dirty stuff. And, as you know, if there is a big crowd of locals then it is probably both delicious and safe to eat. Great post. Anna, totally hear what you’re saying. We both feel that in Thailand and Mexico a lot of the best food is on the streets. Funnily enough, when we were in Thailand late last year, a ‘fancy’ restaurant gave me ‘problems’ that nearly sent me to hospital while researching a book there. The only disappointment in Thai street food was the lame recommendations of the guidebooks! One of our favourite things to do in the world is a stall hop in Bangkok…seriously love it! We were never sick in Mexico City from street food at all on this trip – perhaps a mix of good fortune and good choices. Thanks Renae, diving in is the best idea! Hee! Hee! That’s the idea! Thanks, Jen! So did you make them?! Hi Sarah – not sure if you’ve tried salt bush before? It’s a naturally growing green salty plant that holds a lot of water that’s found in the desert regions of Australia. There, the indigenous people eat it. We had it served on a stunning plate of food in Mexico City at one of the best restaurants, Pujol, which we’ll blog about tomorrow. Cactus is kind of like a cross between that (which makes sense seeing it’s a desert plant) and choko (green, watery). It’s interesting and works very nicely with some ingredients, though it’s not something I’d crave on its own. With that road trip, do take care crossing that border – many Americans are now choosing to fly between Texas and Mexico rather than drive – too dangerous! 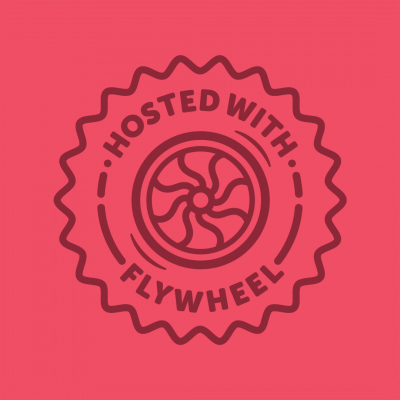 – but you *must* visit Austin and Mexico! Thanks Frank. We need to do our bit! So many visitors miss out because they’re told to only eat in the ‘concierge approved’ eateries, where you see a bunch of other visitors all getting cheese-laden rubbish that’s ‘safe’. Meh. Agree! 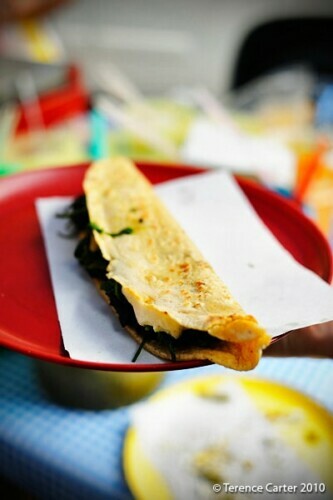 Just thinking about the street food in the city makes us want to return. A trip is long overdue for us too – three years is far too long to go without visiting Mexico City!